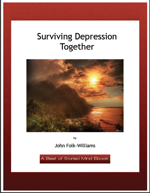 A lot of people think of recovery from depression as an unending process of managing the symptoms. But I have always hoped that recovery is more than remission of symptoms. Before imagining full recovery, however, there’s the enormous task of getting the most crippling effects of depression under control. I don’t mean ending them altogether, but reducing the extremes. Only then is it possible to think straight about the work of getting rid of depression and to imagine what recovery might mean. If it’s possible to get that far, you might find it as empowering as I have to keep focused on the goal of restoring a full life rather than accepting remission of symptoms as the best you can hope for. In looking back at how I’ve lived with depression, I think the most important thing I’ve been able to do has been restoring hope. To do that, I’ve had to move through the deadly stillness of depression, the reawakening phase of early recovery and the creative experience of reconnecting with life. I think reconnecting to life happens through a constant interchange with others, not in the isolation that is so typical of depression. Discovery and learning from experience comes from the responses people have to each other – if they are open to receiving them. There is a constant giving back and forth and from that each person is enriched. That’s what I’m aiming for – rather than thinking that the rest of my life will consist of perpetual management of symptoms. I guess everyone figures out what recovery means in terms of their unique experience. I’ve had to develop a private definition that really works for me. It supports the determination to get better that was one of the first steps toward change. This site has helped me more than you can imagine. My boyfriend is depressed and broke up with me out of no where- I was shocked to see so much of him in your writing. I finally felt like I had valid feelings (as your wife’s role was described) and I felt that I got more understanding on what he is going through as well. However trying to talk to him went exactly as your writing described. He said he loved me but has to “do this alone” and has to focus on his art right now. He seems to be in the active face of it all because he is constantly active, he’s denying that anything is wrong with him that would cloud his judgement, even though mental health and even getting help has been a conversation in the past. He also blamed me not being in the “art culture” on why it would be hard to be together. Music taste got thrown into the convo as well because we have differing likes but music is very important to him. This has been something we have talked about though, as I can’t have deep discussions with him about those things but I can’t hit every single desire for him. That’s what having other friends is for, right? I felt that this was his own insecurities being cast onto me, but it hurts all the same. I am at a loss for what to do. We were intimate when we met up, but he won’t say that there is any hope for the future. I know that might be because he feels hopeless himself. He was angered by my suggestion for him to get help but soon calmed down. He was also very tearful during the meeting. By the end it was like I was talking to the person, not the depression, and he reached out normally afterwards. I know there’s no answer to “how long do I have to wait for him to see this for what it is” but I do want to know how I should proceed. I have been understanding and tried not to push anything when we spoke because I know everything comes off as a demand. Any ideas? Thank you in advance. Your work has saved my brain from spinning out this week. John, do you ever feel like you have had to lower your expectations of life (and of yourself) in order to get to a place of feeling better? I used to strive always to be #1, the best, the brightest, the most competent. And when depressed, I kept thinking, “This is not me and I am not this. I am capable of so much more. I can do better, and I know it.” Now, I feel more comfortable knowing that I can probably apply myself and achieve what I want to achieve, but I’m not so keen on pushing myself 100% all the time. And part of it is realizing that I’m not young anymore (relatively speaking.) I don’t have 60 more years in which to make a name for myself. And it no longer seems important to do so. We can’t all be Shakespeare or Picasso. And I don’t feel like I am putting constraints or limitations on myself as much as just accepting the fact that realistically, there ARE limitations.